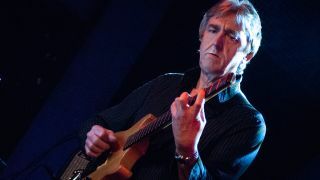 30-day guitar challenge: While arguments about who is ‘the best’ in music are generally unhelpful and meaningless, Allan Holdsworth must rank as one of the most universally respected guitarists by fellow guitarists. He received superlative praise from masters of the guitar of every style from Frank Zappa (who claimed that Holdsworth “single-handedly reinvented the electric guitar”) to Carlos Santana to Joe Satriani to John McLaughlin to Guthrie Govan to George Benson to Tom Morello and Eddie Van Halen (“the best in my book”). And if forced to name just one, Steve Vai would dub him "the best guitar player". Despite his influence and inspiration to so many guitarists he never reached the household-guitarist-name status of players like Hendrix, Clapton, Beck, Van Halen, Jimmy Page and Brian May, probably due to the challenging nature of his music, misfortune with management and insufficient associations with ‘big acts’. This apparent contradiction between enormous respect within his field and his popular ‘success’ is just one of many other contradictions in the man; a reluctant guitarist who mastered and then revolutionised the instrument, a traditionalist Yorkshire brewer with a futuristic musical vision and cosmic sound. A laid-back conversational persona, with the unlaziest attitude imaginable to the development of theory, improvisation, rhythm and technique. A jazz guitarist without an f-hole, headstock or blues lick. A lauded musician who humbly shrugged off any suggestions of his proficiency. An enviable technique always in the service of expressive, egoless music. A pub musician light years from Mustang Sally. There is plenty of great tutorial and transcription material on Holdsworth’s music (and much by the man himself), so this article has two specific aims: 1) as an accessible (and hopefully inspiring) introduction to Holdsworth’s guitar style and music to the uninitiated - and even those who might feel alienated or even intimidated by the music or technical level, and 2) a succinct overview and, hopefully, a fresh perspective of his theoretical and musical ideas for those who know and admire his playing but are looking for a deeper understanding beyond transcription and technical exercises. I’ve structured the article by scale and created some progressive studies based on each scale. Finally, a short study piece is presented that uses all of these concepts. The very least (and perhaps most important) thing I hope you’ll learn from this article - and by Holdsworth’s example - is an appreciation of the endless potential that can be achieved by the dedicated and humble pursuit of a personal musical vision. Holdsworth was a radical inventor, not just in brewing methods and guitar systems, but with every aspect of music. When he was a teenager, while most budding guitarists were happy with a box position and a couple of chords, Holdsworth decided not to accept the traditional scales, but start again in a way that made sense to him. What that meant was to personally discover what scales could be built from the 12 notes in an octave, by literally writing out every possible combination. To help explain his approach, imagine we labelled the 12 notes [0-1-2-3-4-5-6-7-8-9-E-T]; a five-note scale could be [0-1-2-3-4] or [0-1-2-3-5] or [0-1-2-3-6] and so on and on, to create 792 unique scales (there would also be 924 six-note scales, 792 seven-note scales, 495 eight-note scales and so on). Holdsworth calculated 100s of scales in his ‘phonebook of hell’ and worked through them, rejecting ones that were “too crowded” to find the ones that most appealed, gave them his own naming and notation system, and worked them out in every position of the neck. Holdsworth has listed his ‘favourites’ (a few of which are ‘rediscovered’ conventional scales) but he also used many that do not have conventional names, and some spread over more than one octave. These scales are used as the basis of all his ideas, so we will do the same here, but using the conventional naming system for convenience. What is extraordinary is that he didn’t separate the modes and would just use the full range of the guitar for every scale (“family”); the root and conventional resting points do not apply and you can hear this as fluidity in his soloing and chord construction. The scope of this article doesn’t allow an in-depth analysis, so I’ve just selected two (Major and Melodic Minor) and hinted at some of the others in the examples; but I encourage you to explore ‘the phonebook’ further. [C Major, all positions on the fretboard] Let’s get to grips with this scale using another of Holdsworth’s radical approaches. Rather than running scales in position, he preferred a fluid ‘saxophone’ sound and range. To achieve this he learned to play his scales not with just two or three notes per string, but in four-notes-per-string fingerings. You can finger this with all four fingers of your fretting hand or incorporate a position shift (which you may need in the lower - or perhaps all - positions). Go with what works for you (and the hands you possess). Holdsworth had an incredibly fluid approach to playing, plus amazing command of the fretboard; to develop this it’s important to investigate the scale in a number of ways. Here’s a lateral approach to the scale. This wide interval approach (avoid octaves and triadic forms) is typical of his style. Holdsworth advocated “letting your eyes dance over the scale” rather than relying on muscle memory. Here’s a more sporadic approach: I’ve written a pattern that makes sense so that you can play it by absorbing the scale rather than learning a lick. Do invent your own (there are hundreds to choose from). Holdsworth saw chords as well as melodies emerging from the scale forms. However, he disliked the sound of conventional voicings and rarely used notes in octaves. Even when playing a ‘normal’ chord, he voiced the chord either closely or with wide intervals giving an ethereal quality. Here’s one of his voicings for C Major 7, moved along the scale to provide Minor7, Dominant 7 and Minor 7 flat 5 chords also. Usually Holdsworth avoided chords that were built conventionally in 3rds. Triads, 7th and 9th chords would include added notes, omitted notes and unexpected bass notes. In general, most of his voicings would have four notes without any doubling of the octave. This creates extremely beautiful and sophisticated results even within one ‘scale family’. You’ll notice that the third chord (Esusb2/A) is quite a stretch so take your time. Here’s another Holdsworth voicing played through the Major scale - the final chord is particularly stretchy so please be careful. Holdsworth had large hands that were used to these stretches over many years of playing; he also used light-gauge strings and was a virtuoso - so don’t be a hero! Holdsworth used hundreds of voicings, but I’ve selected a few, all sourced from the major scale. I’ll leave it to you to experiment with harmonising each of these through the scale, or indeed inventing your own. Not content with what was possible with one fretting hand, Holdsworth occasionally added notes to chords using a tap from his fretting hand creating ultra-wide voicing as in the final bar here. Here’s a really useful Holdsworth device, using legato along one string. You have the choice here of using legato with fourth, third, second and first fingers, or using four, two and one and then sliding down to the next note. It’s worth working on both with the caveat of looking after the health of your hands. Holdsworth was unbelievably melodic and tasteful, and although it’s easy to be distracted by his phenomenal technique, he squeezed expression out of every phrase. Here’s how the basic idea of Ex 8 might be turned into a melodic phrase. Add vibrato (from the trem if you have one) and use a delicate touch. Let’s build on Ex 9 with the use of some other strings; this creates more range and timbral variety. Although the scales are fundamental to Holdsworth’s playing, he spices them up in a number of ways. One approach is to insert chromatic notes between the ‘target’ notes. The start and end notes in each phrase are all in D Melodic Minor. Again, there are endless possibilities in how this can be employed. Time to get a little terrifying. Holdsworth could sweep with the best of them (as well as playing with extraordinary time, harmony and touch). Here’s a little taste of his combination of sweeps and slides to make a saxophone-like phrase that’s beautifully fluid. Here’s a real workout for legato and string skipping. Every note is in D Melodic Minor, but the three-note cell leaps around the fretboard. Be careful not to exhaust your fretting hand, by giving yourself breaks both within the phrase and in your practice sessions. Let’s see how Holdsworth defies the underlying scale for dissonant effect. The following example uses a couple of his devices known as side-stepping and constant structure. In bar 1, a three-note phrase is transposed down chromatically. This ‘sidestepping’ is a way of producing dissonance that makes sense to the listener. Bars 2 and 3 are more subtle: C Major arpeggio descends chromatically to B to Bb to A, but the inversions change, notes are left out and the phrase ascends the fretboard, making the side-step less obvious. In bar 4, an intervallic structure is transposed sporadically, in spite of the key, creating an angular dissonance.